A friend at work mentioned that he was looking at a propane powered smoker being sold at Walmart. 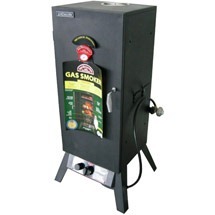 He thought it was a good deal, $108, since the smoker had such good reviews. I took a look at it and agreed. So I bought it. My first test was pulled pork using an America’s Test Kitchen recipe. Yup, this makes barbecuing much easier. No reloading the charcoal after a couple of hours with this bad boy. I think I will smoke a turkey for Thanksgiving.